The Fenix UC35 V2.0 rechargeable flashlight is the 2018 upgrade to the Fenix UC35 flashlight. 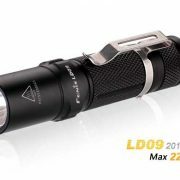 Fitted with the Cree XP-L HI V3 LED, this light delivers a maximum 1000 lumens at a distance of 873 feet (266 meters). Turn the light on and off with the tactical tail switch and cycle through the six lighting modes via the newly designed metal side switch—which also has a built-in battery level indicator. You can achieve an incredible 800 hours of runtime when using the new moonlight brightness level. 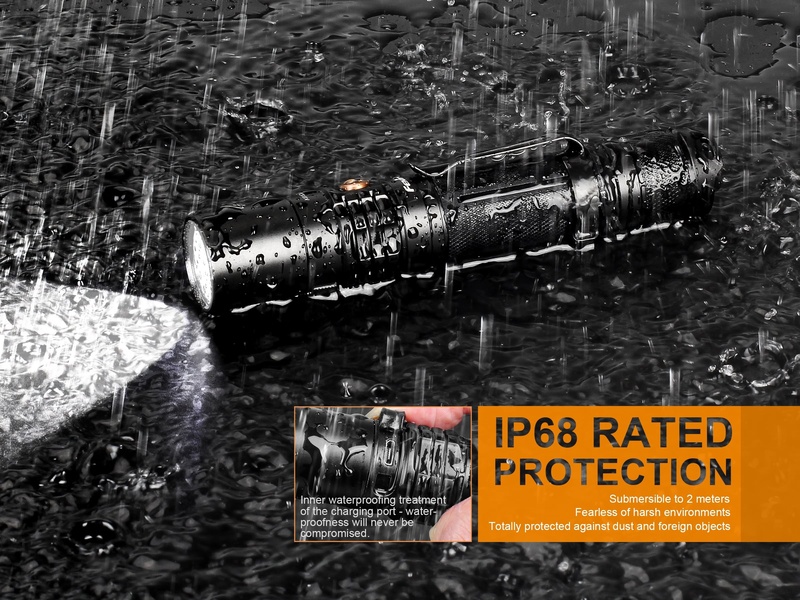 Compact and built-tough, the UC35 V2.0 flashlight is IP68 rated; dust proof and waterproof underwater to two meters. Fenix UC35 V2.0 Flashlight,Micro USB charging cable,Spare rubber switch boot, Lanyard, Spare O-ring, Holster, ARB-L18-3500 Battery. The tail switch is the tactical, and the side switch the functional switch. Tap the tactical switch to momentarily turn on the light; release it and the light will go out. Fully press the tactical switch to constantly turn on the light; press once again to turn off the light. With the light switched on, single click the functional switch to cycle through Turbo→Moonlight →Eco→Low→Med→High. With the light switched on, press and hold the functional switch for 0.5 seconds to enter strobe, click once again to return to General mode. The light will accumulate a lot of heat when working at Turbo mode. 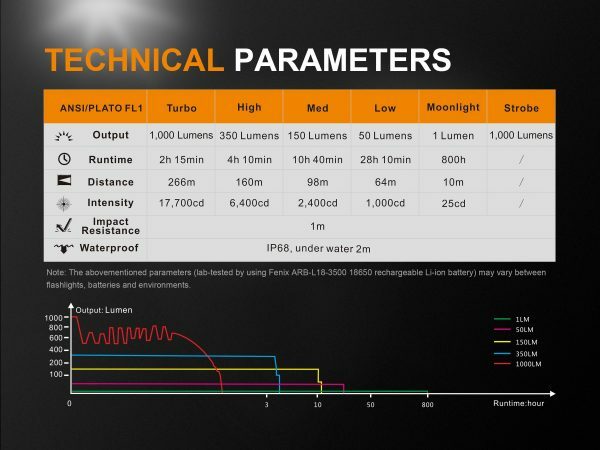 When the light is overheated up to 60°C or above, the flashlight will automatically step down a few lumens to reduce the temperature; when the temperature is lower than 60°C the output will gradually return to Turbo output level. 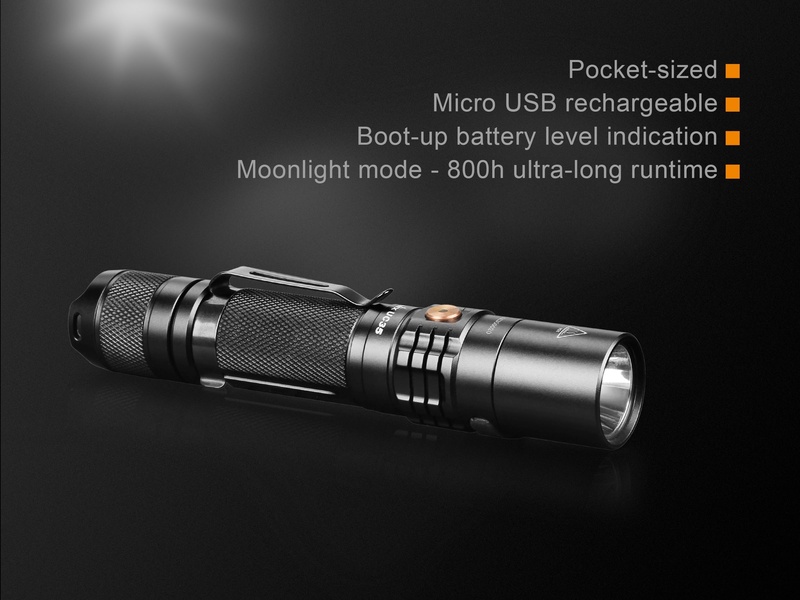 When the voltage level drops below 3V, the flashlight is programmed to downshift to a lower brightness level until Moonlight output is reached. When this happens in Moonlight mode, the battery level indicator will flash red to remind you to replace the battery. 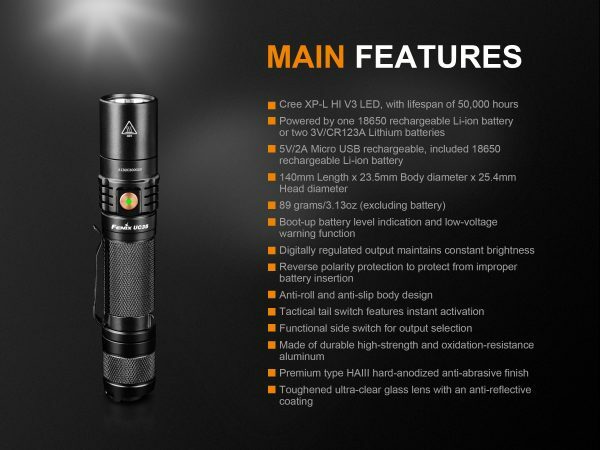 To ensure normal use, the flashlight will work until the battery runs out or the battery over-discharging protection activates. 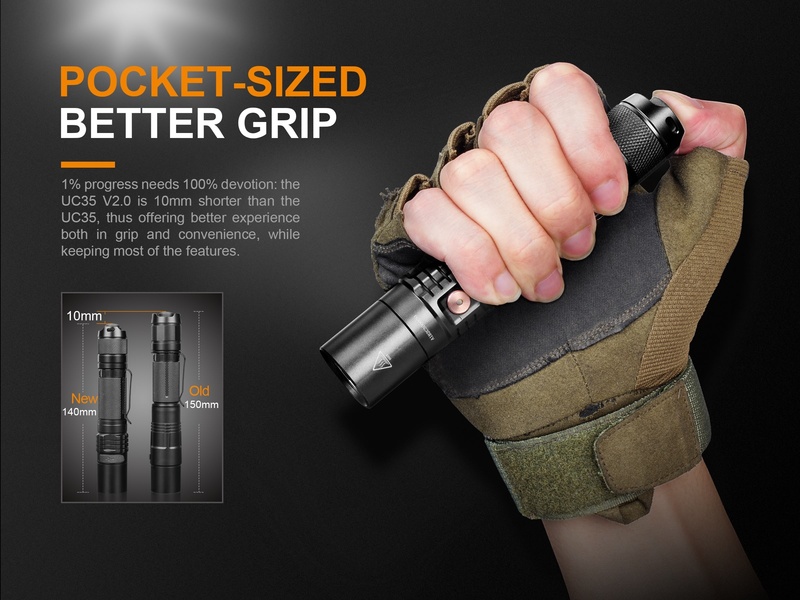 Note: This only works with rechargeable Li-ion 18650 battery. 1. Turn off the light. Plug the USB side of the charging cable into any USB power supply. Uncover the dust cover of the light, and plug the Micro USB side of the charging cable into the charging port of the light. 2. The battery level indicator displays red while charging and turns to solid green when charging is complete. 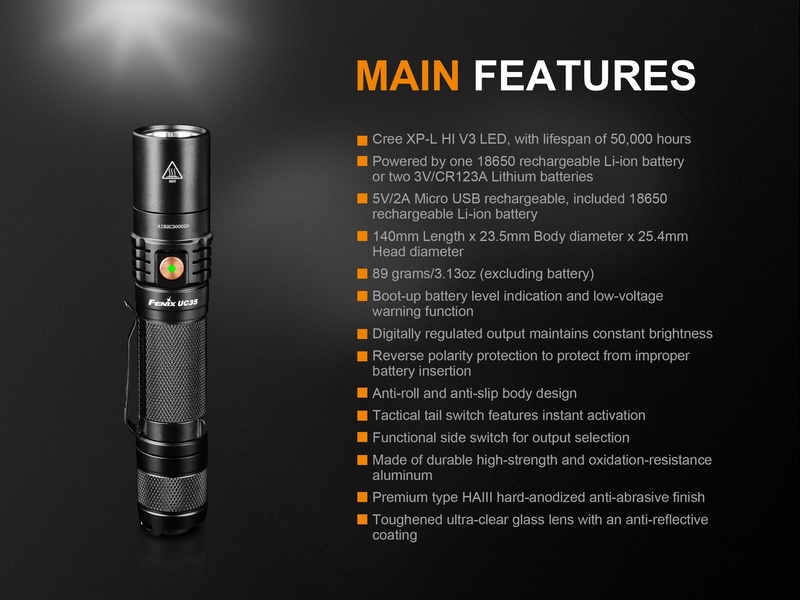 The normal charging time of the included Fenix ARB-L18-3500 is about 3.5 hours. 3. Once charging is completed, be sure to remove the charging cable and replace the dust cover to protect against dust and foreign objects. 4. Recharge a stored light every four months to maintain optimum performance of the battery. 5. Only Low output can be used while the light is being charged, but charging time will be prolonged. 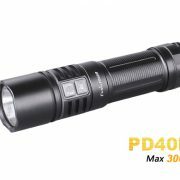 The super bright Fenix PD40R is now USB rechargeable. 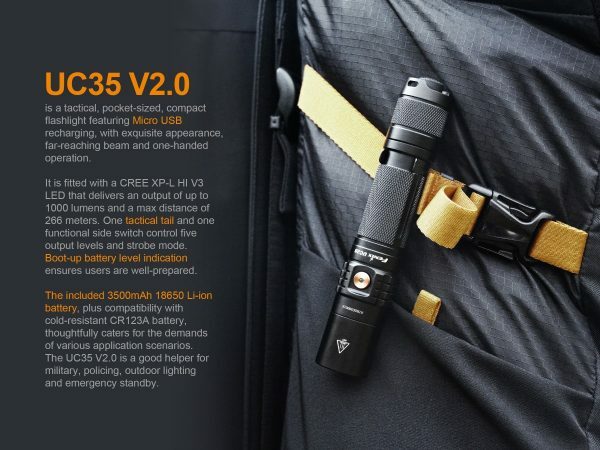 Fitted with Cree XHP70 LED, it is powered by a 26650 rechargeable power battery, which activates the maximum output of 3000 lumens and extends the runtime dramatically. In addition, the flashlight features digitally regulated output and IP68 classification, plus this compact flashlight also offers a comfortable grip. General lighting modes and strobe are independently controlled by the two switches. It will be your trusted companion. 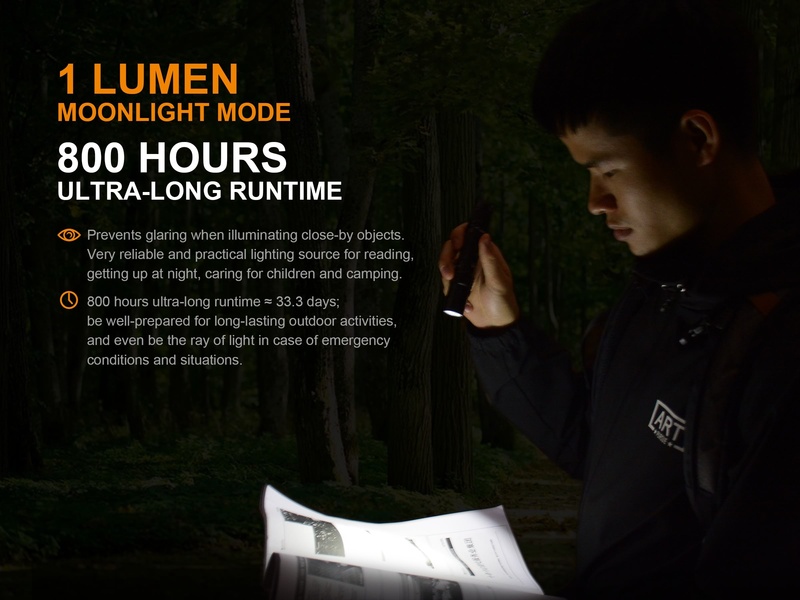 The newly upgraded HL30 is a high-performance outdoor hiking headlamp. 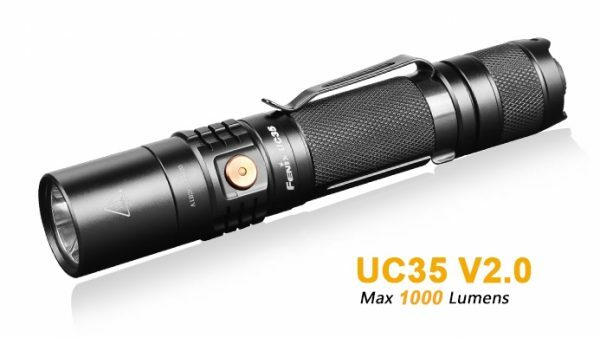 It features five output levels, which emits a max output of 300 lumens. Fitted with professional wide-range floodlight, plus red light and SOS, it competes kinds of complex hiking and camping environments. This lamp is powered by 2 readily available AA batteries. 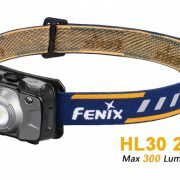 Additionally, the dual switches operation, lockout function, IP67 rated protection, reflective and sweat-channeling headband, making you feel secure in outdoor activities, with the accompany of HL30.